Integrated appointment and career development is not just aimed at recruiting and retaining professors but includes career development options through FAU Career Tracks which are aligned with the general professional career pathways that are available at German universities. This approach is based on the most stringent international standards as well as documented, transparent performance criteria and clearly defined career options. At FAU there are three parallel, quality-assured tracks that are equivalent in terms of prospects for appointment and career development – these are known as the FAU Career Tracks. These three career tracks provide for the professional development of all academics at FAU and are intended to facilitate the careers of the next generation of academics and the appointment and continuing development of professors. FAU Career Tracks guide researchers towards a career option that suits them perfectly. 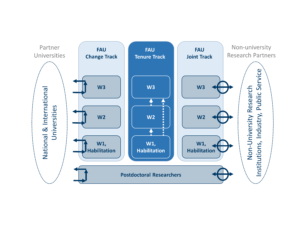 The FAU Change Track involves a move from one institution to another represents the most conventional form of career progression and appointment. It contributes to the expansion of the national and international academic network and makes sure that the necessary dynamics and flexibility of the academic system are preserved by means of personnel changes. The FAU Tenure Track uses a stabilising approach for performance-orientated development of in-house talent. It fills the strategic gap in the standard career and appointment system by providing for reliable career options. Tenure track professorships are intentionally linked with the key research priorities at FAU in order to strategically strengthen these profile-forming areas. Tenure Track professorships (W1 and W2) are defined as ‘Open Topic Tenure Track’ professorships in connection with the key research priorities of FAU. The FAU Joint Track opens up career development routes between FAU and its non-university partner institutions, be they research institutions, industrial enterprises, service providers or public administration organisations. 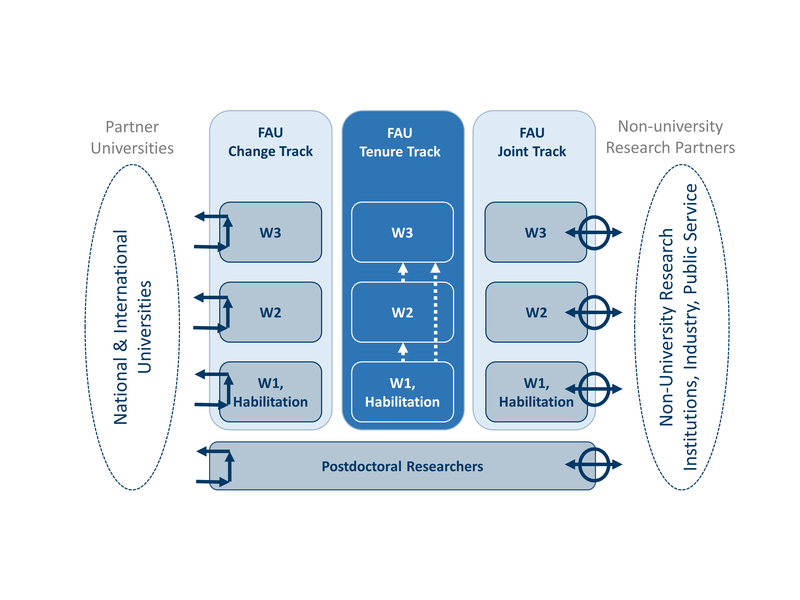 The options of inter-institutional career development and joint appointments in collaboration with non-university research institutions enhance the appeal of the FAU Joint Track.